Image caption Are you feline a little blue? Cats and dogs were left resembling "Smurfs" when the air turned blue in a seaside town. The pets were a little off-colour after sacks of ink powder ruptured in a fire were blown around parts of Clacton, Essex, in the wind. The fire broke out in a shed on Tuesday, the East Anglian Daily Times first reported. Essex Fire Service said the powder was non-hazardous and was expected to fade as the animals were washed. Image caption "This doesn't seem to be doing the trick"
The fire broke out in a boat and shed on Coronation Road in Clacton shortly before 21:00 GMT. Eight sacks of blue ink powder next to the shed also caught light. Environmental health officers confirmed the powder was harmless, and a trench was dug to isolate it. However, the fire service said it was likely to smoulder for several days, and the ink - carried in the smoke and wind - has covered nearby roofs and patios as well as several animals. Builder Terry Oliver, who lives close to the site told the BBC he first realised all was not quite right when he saw the first blue animal. 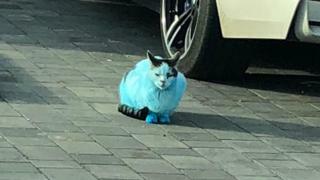 "It's not often you see a blue cat sitting on your driveway," he said. "My little girl thought they looked like Smurf cats." He added: "It's quite blue around here and a bit strange." A number of cats, dogs and even rabbits are reported to have turned blue since Tuesday.